One of the earliest surviving pieces of English dance music has survived with the 13th–14th century manuscript, Douce 139, now in the Bodleian Library, Oxford. It is exciting in its musical drive and complexity, but interpretation has its problems. The scribe appears to have changed his mind partway through on several issues of notation, leaving us to make judgements about intention. The music is untitled, and is often named Estampie or English Dance in modern sources. This article works through the puzzles in order to gain some performable answers. What is an estampie? Is the Douce 139 piece an estampie? How can the musical problems left by the scribe’s imperfect notation be reconciled? 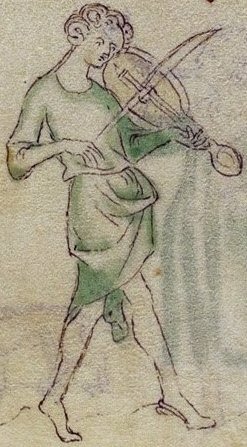 Drawing on music theorist, Johannes de Grocheio, writing in c. 1300, this article looks for solutions, with a video of one possible interpretation on citole. Double recorder (then called a pipe or flute), gittern and three singers in Saint Martin is knighted by Simone Martini, 1280-1344. The most fundamental question of all in playing early music today is: how can the music be played to reflect historical practice? 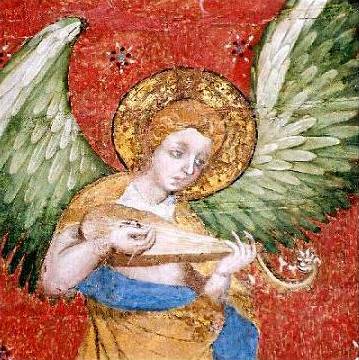 This is the first of three articles looking at historically-informed ways of performing medieval music, aiming to be a practical guide, with plenty of musical examples and illustrations, and a bibliography for those who wish to delve further. The gittern was one of the most important plucked fingerboard instrument of the late medieval period. Loved by all levels of society, it was played by royal appointment, in religious service, in taverns, for singing, for dancing, and in duets with the lute. Yet we know of no specific pieces played on this instrument. What we do have are many representations of it being played in a wide variety of contexts and one surviving instrument of the 15th century, and from this we can reconstruct something of the history and repertoire of this widely-loved instrument. This article begins with a video of a French estampie played on gittern.